Cell phones have come a long way over the past 5 years, and it can be said that they are helping to define what we call "modern technology." With the ability to access the internet from almost anywhere in the country to taking high definition photos and videos, today's cell phones are certainly cutting edge. As I have mentioned in previous articles, the leader in this field is Apple with their iPhones, iPods and iPads. There are over 300,000 applications or "apps" available in the iTunes store. You can find everything from productivity software to social networking apps to games. Today, for the first time in this blog, I'd like to talk about a game. The Walt Disney World Trivia App is really a simple quiz game that tests your knowledge of WDW. This app features over 250 questions about Magic Kingdom, Epcot, Hollywood Studios, Animal Kingdom, and other Disney World locations like the water parks and Downtown Disney. The questions are multiple choice with four potential answers. There are three forms of gameplay with the Magic Mode being the main one. Here you answer questions until you get one wrong and the game is over. At the end, your score is published on the online leaderboard so you can see where you rank among the other players from all over the world. I'm proud to say that I have made it atop the list on several occasions. That can be chalked up to either too much time on my hands or the fact that I'm a complete Disney World geek! This game is a lot of fun to play when you are just looking to pass the time. I find myself playing it when on hold with some large company's customer service hotline or even when I'm just stuck in traffic. It gets pretty exciting when you get up over 200 questions answered in a row because you know there is a chance for a perfect score. For those of you with a portable device that starts with the letter "i," I definitely think that heading over to the iTunes store and spending $2.99 on the Walt Disney World Trivia App is worth it. Let me know if you ever approach a perfect score. Are you up for the challenge? It is hard to believe that I am 17 articles into a blog that is dedicated to modern technology and this is the first time I'm talking about Twitter. Unless you have been living on a deserted island without a cell phone tower, you have probably heard the word "Twitter" sometime in the last few years. However, I still know many people who really don't know what it is all about. Today, I'm going to tell you how you can use Twitter to you stay connected to Disney World. First, I would like to give you a quick overview of Twitter for those of you who haven't used it yet (Hi mom and dad!). In a nutshell, Twitter let's you send a short message of up to 140 characters to large numbers of people at one time. In Twitter jargon, you are "tweeting" to your "followers." Before you dismiss this as some sort of technological cult, becoming a follower just means that you subscribe to another persons' or organizations' tweets. Although this process takes place over the internet, it is most often done between mobile phones. It is also completely free to use. Anyone can set up a Twitter account in a matter of minutes. Once you have a username, you can start documenting what you are doing throughout the day for all of your friends and family to see. Some people enjoy learning that their friend just ordered a caramel swirl latte from Dunkin Donuts or that their uncle Bob just got his oil changed, however Twitter can be used for so much more than just social networking. It is also a great way to get news about a topic or event you are interested in. This is how I like to use this great communications tool when it comes to Disney World. There are numerous people and organizations you can "follow" to get up to the minute news and updates about the goings on at the vacation kingdom. Many of these people are associated with podcasts, websites, or blogs. You can do a simple search for Disney World on the Twitter website to find a pretty sizable list of tweeters. However, I want to mention a few that I subscribe to that help me get my Disney fix on a daily basis. First, there is Ricky Brigante of the Inside the Magic podcast. He lives very close to Disney World and often tweets (with picture and video attachments) from inside the parks! He can be found at insidethemagic. Next is Lou Mongello who is the author of the Walt Disney World Trivia books and host of the WDW Radio Show podcast. His Twitter handle is loumongello. The final two tweeters that I subscribe to are WdwDailyNews and TheDis. They both are great sources for current Disney World news. I mentioned earlier how hearing about uncle Bob's oil change or your friend's latte may not be very interesting. However, if you subscribe to friends and family who are tweeting while on their Disney World vacation, that is a whole other story. If uncle Bob is tweeting a picture of the new Fantasyland construction, that would grab my attention. I certainly encourage setting up your own Twitter account when you are heading down to see the mouse. It is a fun and easy way to keep in touch with those who wish they were there. Finally I want to put in a shameless plug for MY Twitter account. It is an easy way to see when I write a new article for this blog. You can subscribe to me at DigitalDisWorld. I had to shorten my handle a little due to the username length restriction imposed by Twitter. I hope to see a bunch of new subscribers in the near future! Walt Disney World does a great job at engaging all of our senses as we tour the theme parks. 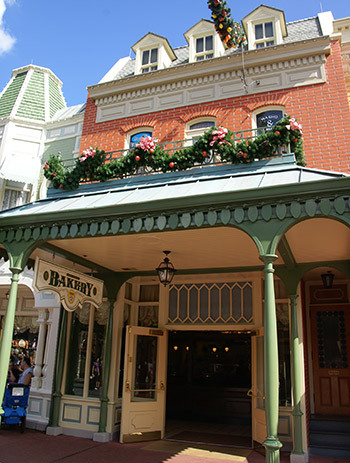 The visually stunning icons like Cinderella Castle or Spaceship Earth and the amazing cookie aroma being emitted from the "smelitzer" outside of the Main Street Bakery are just a few examples. However, I believe that the most important and often overlooked aspect of the Walt Disney World experience is what we hear. As many of you know, the Disney theme parks are set up to be like a movie that you are entering. The best example of this is definitely the Magic Kingdom. As you walk through the tunnels under the railroad station, you are greeted by coming "attraction" posters. Next, you arrive in Town Square and the curtain has risen on a production that you just became a part of. 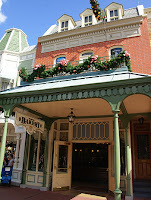 As you walk up Main Street, the "credits" are posted on the second floor windows, which pay homage to the cast members who were instrumental in creating this wonderful place. There are countless more movie-like examples throughout the parks, but you see what I'm getting at. Now, what would a movie be without a soundtrack? The music that is played throughout the entire Walt Disney World Resort really helps to make the magic. There is almost never a time that you are walking through one of the theme parks or even around a resort hotel where there isn't an appropriately themed soundtrack playing in the background. Sometimes it may simply be a quiet instrumental piece that is setting a mood while other times it could be a major Disney movie hit that is getting us excited to enter an attraction. The bottom line is that Disney knows how to use music to really add to our experience. There are several souvenir albums available containing some of the music that we hear at Disney World. However, what is available to the public is a very small percentage of the overall catalog. This is where DTunes Radio comes in. I discovered this website about a year ago and it is such a great source of streaming Disney audio. It contains eight "live" stations that play everything from Disney movie music to Disney World background music to full theme park attraction soundtracks. There are also stations dedicated to Disney parades and fireworks shows as well as resort hotel background music. Much of what you can listen to on this site is just not available anywhere else that I'm aware of. If you want to close your eyes and be "virtually" back on your Disney World vacation, this is the place to do it. Talk about getting a quick Disney fix! Check out the DTunes Radio site at dtuneslive.com. It is free to open an account and listen to all of the great Disney music and soundtracks. There are several interesting features and options on the site including forums and Disney news. This site is also mobile friendly as I often listen on my iPhone! Earlier this year I wrote about the Walt Disney World dining website. Today I am going to talk about a great iPhone / iPod app that is not affiliated with Disney but is a wonderful compliment to the Disney dining website. Created by VersaEdge Software, it is simply called "Disney World Dining" and currently costs $1.99. I used this app many times on my recent vacation and found it to be very useful. First and foremost, Disney World Dining provides restaurant information for over 150 dining locations around Walt Disney World. This info is not limited to just the theme parks as you will also find detailed info for the individual resort restaurants. In addition to restaurant locations, descriptions and photos, this app provides excellent menu information. You can find complete lists of food choices as well as what each meal is served with (fries, coleslaw, etc.). However, the part that I like the most is that Disney World Dining also includes the prices! You can get a pretty good idea of what a particular meal is going to cost if you are trying to stick to a budget while on your vacation. Another terrific feature of this app is how it informs us of the different discounts that are available. Each restaurant will show if there is a discount for annual pass holders, Disney Vacation Club members, or Tables in Wonderland members. In addition to the discounts, you will see if the Disney Dining Plan is accepted as well as the number of credits needed for that dining location. The final feature of the Disney World Dining app is the ability to create a dining schedule with your reservations. You simply tap on the little clock symbol while looking at a particular restaurant and enter the time and date of your reservation. This is a handy way to keep track of your scheduled meals throughout your trip. In addition to keeping track of your reservations on your mobile device, you can email your list to the other members of your traveling party. You can even email this list to your friends and family at home to make them a little jealous, or at least get them to start thinking about booking their next Disney vacation. Remember, Disney World has shows and attractions simply to keep you occupied between meals! In addition to my normal articles about using modern technology to stay connected to Walt Disney World, I have decided to launch a new segment called O.T.D. or "On This Date." I will be highlighting important dates in Disney history on the anniversary of those events. I will be emphasizing the history of Walt Disney World by writing about park and attraction openings, special events, and major changes to the resort. Although most of what I will be writing about will have taken place many years in the past, I am posting my first O.T.D article only hours after this particular event took place. I am talking about the closing of Mickey's Toontown Fair in the Magic Kingdom. 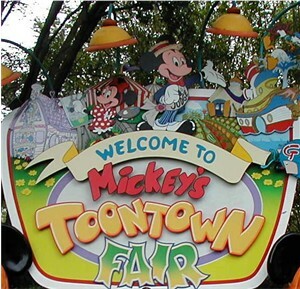 Mickey's Toontown Fair was the first and only "land" to be added to the Magic Kingdom. Tonight, it became the first land to be closed. It opened in June of 1988 as Mickey's Birthdayland to celebrate Mickey's 60th birthday. It was intended to be a temporary area of the park and was only supposed to last for about a year. This land became so popular, especially with young children, that Disney decided to keep it open and changed its name in 1990 to Mickey's Starland. Disney "re-themed" it one more time, and in 1996 it became Mickey's Toontown Fair. Although it wasn't a big area in the Magic Kingdom, Mickey's Toontown Fair was certainly very popular. It was the home of Goofy's barnstormer which was the only "kiddie coaster" at Walt Disney World. It also housed a great little playground where kids, including my own, would play for long periods of time while the grown-ups looked on from park benches. It was a nice place for us adults to give our aching feet a rest! The biggest draw to this land, however, were Mickey and Minnie's country homes. Behind Mickey's house was the "Judges Tent" where you could actually meet the big cheese and his girl. Mickey's Toontown Fair will always have a warm place in my heart, for this is where our son Chris was first introduced to these famous mice. The closing of Mickey's Toontown Fair is bittersweet. On one hand it is sad to see this area of our beloved Magic Kingdom close after being there for over 20 years. On the other hand, there is great excitement building for what will be replacing it. This land will be absorbed by the incredible new Fantasyland expansion that is currently under construction. Fantasyland will be doubling in size with the new section opening in phases starting in 2012. The area of Fantasyland that will be replacing Mickey's Toontown Fair will be known as Storybook Circus. The only attraction that will be remaining from the land that closed tonight will be the kiddie coaster, which will be renamed The Great Goofini. In addition to the coaster, this area will be the new home of an expanded Dumbo the Flying Elephant ride which includes an interactive queue. The biggest question on most people's minds is "Where are we going to be able to meet Mickey and Minnie?" Although their country houses will soon be demolished (which is not a pleasant thought! ), Disney is hard at work at creating a new meet-and-greet area in Town Square Exposition Hall, right inside the entrance to the Magic Kingdom. I think stopping in to say hi to Mick and Min will be a fun way to start your day. We can't forget that this was all started by a mouse! So when the Magic Kingdom opens tomorrow, the guests walking through the gates won't see Mickey's Toontown Fair depicted on their park maps, however the memories that most of us made there won't soon be forgotten. As we look forward to the Fantasyland expansion, I'd like to say: "Goodbye old friend and thanks for the memories!" TouringPlans.com is a great website that I discovered just prior to our most recent Walt Disney World vacation. It was created by the authors of the Unofficial Guide to Walt Disney World. Essentially, touringplans.com is the best place to find predicted crowd levels for each park for the next 365 days. You can also find step-by-step "touring plans" to help you efficiently navigate the parks depending on the amount of time you have and the ages of the people in your traveling party. I rarely recommend websites that charge subscription fees, but this is definitely an exception. There is useful information at touringplans.com without spending any money, but the $10.95 price tag for a year's subscription is worth every penny. The amount of time you save (and lines you avoid) by using the information from this site is priceless. The first section of touringplans.com to visit is the crowd calendar. Here you will find a ranking for the overall expected crowd levels as well as for each park individually. The rankings are based on a scale from 1 to 10 with 1 being the least crowded and 10 being a situation that you should definitely try to avoid unless you love standing in long lines. The rankings are not just the opinions of a couple Disney World veterans, they are incredibly accurate predictions based on years of research and scientific data. My favorite part of the crowd calendar is the breakdown of what to expect at each park. There could be when the Magic Kingdom can be ranked as a 1 and Epcot can be a 4 or 5. These numbers represent a major difference in wait times. You would certainly find me at the Magic Kingdom on that day! I utilized this system on our recent trip and found it to be a great tool to help us enjoy our vacation without waiting in long lines. The second part of touringplans.com are the "touring plans." These are detailed lists and accompanying maps that give you the best attractions (in the best order) to see based on your time and ages of the people in your group. For example, a one day Magic Kingdom touring plan for families with small children will definitely be different from a two day plan for seniors. Just like the crowd calendar, the touring plans are based on a huge amount of research and historical data. They are great tools for all of us but especially helpful for newer visitors to the vacation kingdom. Finally, the last section of the site is entitled "lines." In a nutshell, this area of the website will give you actual, current wait times for each attraction. In addition, it provides fastpass return times. This information is best utilized on a mobile phone unless you really want to lug around a laptop computer as you make your way around the parks. They have mobile phone versions of the website as well as a "Lines" iPhone app which I am going to dedicate an entire article to in the near future. For now, I recommend subscribing to touringplans.com for anyone who is planning a trip to Walt Disney World. You won't be sorry! The Disney Parks Blog has produced two amazing and very unique videos that are certainly relevant when talking about using modern technology to keep us connected to Walt Disney World. They are titled "A Model Day at Magic Kingdom" and "A Model Day at Epcot." They are each about three minutes long and portray a fast motion and miniaturized version of an entire day at these parks. It is hard to describe in words what I mean by miniaturized, but when you watch the videos you'll see what I'm talking about. The technology utilized in putting these short films together is called tilt-shift photography. It is a technique in which a tilted camera lens captures pictures that are partially out of focus, creating the illusion that real life objects and people appear to be miniature scale models. Thousands of photographs were shot using time lapse photography throughout the day. These photos were then strung together in succession, creating a high speed "motion picture" that looks like it could have been taken with some sort of funky video camera. The "Model Day" videos are a great way to get a quick Disney World fix in only three minutes. You can check out both of them through these direct YouTube links: Magic Kingdom and Epcot. They can also be found over at the Disney Parks Blog. In addition to the two videos that I have talked about here, there is actually one more that has been made using the same technology and it is based on the Disney Cruise Line. Be sure to check out that one as well! One of the most amazing yet complex aspects of Walt Disney World is the transportation system. Tens of thousands of guests are transported throughout the 47 square mile property each and every day. If you don't have access to a car, you need to rely on the buses, boats, and monorails that Disney uses to get you where you want to go. Most of the time the trip will consist of a ride between your resort and one of the theme parks or possibly Downtown Disney. However, there will be times when you want to travel between two resorts or two theme parks. These trips can be a little more difficult because there aren't too many non-stop flights that get you from point A to point B. This is where the TWiz Transportaion Wizard App comes in. The TWiz is an iPhone and iPod Touch App that was developed by Laughing Place Communications and can be found at ourlaughingplace.com or in the iTunes App store under "WDW Transportation." It is a very simple to use app that allows you to pick your start point and destination. It then gives you a list of transportation options along with the estimated time for each option. This information can be extremely useful when you are trying to get from your resort to a dinner reservation at another resort. It is also handy when attempting to see both Illuminatons and Fantasmic on the same night, which we pulled off on a recent trip. In the case of a resort to resort trip, there is rarely a non-stop option. This app gives you the best connection based on your specific locations. Many times a simple bus trip to Downtown Disney would be the best place to transfer, but this is definitely not the case if you were going from the Grand Floridian to the Wilderness Lodge for example. For this trip, the TWiz app would send you via the Magic Kingdom. Another example would be going from any resort to Disney's BoardWalk. Again there are no direct options, but the TWiz will find the best route and simplest transfer. At $1.99, the TWiz app is a must have for anyone traveling to Walt Disney World with their handy portable Apple device. In addition to Disney transportation guidance, it also gives good travel time estimates for driving a car between the many locations on property. Finally, this app gives you helpful transportation tips related to the specific locations that you select. I highly recommend the TWiz app from personal experience!